How Relative is $100 Dollars Per Laptop? 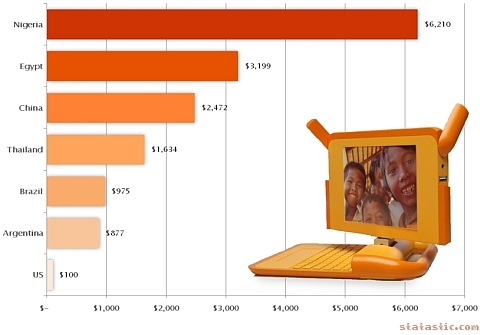 While Satastic doesn't have the latest prices, the OLPC laptop is now estimated to be $140, not $100 dollars per laptop, Satastic did do a very interesting comparison of $100 for different countries targeted by the One Laptop Per Child project. $100 in Nigeria is the equal to nearly two months income. To give Americans a sense of how much $100 is to the average Nigerian, imagine sending your 8 year old to school with a $6,000 laptop. Now imagine living in a country with an epidemic of corruption, in a shanty with no electricity or running water. If laptops were selling for $300 in developed nations, it would provide a strong, and unfortunate, incentive for Nigerian parents to sell their children’s laptops. You couldn't be more right, Statatic. I know that I, for one, will be looking for an eBay OLPC the day they ship, and I know I'll not be disappointed. Oh and don't think Nicholas Negroponte is worried about it. Last year he even said that theft was an acceptable distribution method. I wonder if wholesale resale is another one too? If you find one for sale on ebay, I rather doubt any of the money will make it to the family of the kid who originally had the laptop. More likely, the cash would end up in the hands of a middle ranking bureaucrat or an employee of the Ministry of Education. That is what I am afraid of. When the laptops make it to countries that don't have strict controls, I see a good number siphoned off by officials for gifts or resale. Then, middle level bureaucrats take their cut, and last but not least, local thieves swipe laptops from kids on the streets and back trails of towns and villages. Or, worst case, a family could sell the child's laptop, preferring the money for food today than education for tomorrow. No matter which way, they will be for sale the day after they ship, guaranteed. First, I think this is a great program, truly. However, I do have other frustrations that spill over: I've been concerned about the sexiness of problems overseas vis a vis those in communities literally a few minutes away. Do people evaluate the risks inherent in international distribution vs. domestic? Or is it a market-opening decision? Or a political alliance one? Or is it just the seduction of leverage: "I'm giving $100 but it's like giving $6000!" 1. Nicolas Negroponte found the domestic teacher's unions to be adamantly opposed to his idea without drastic increases in teacher training. Thanks! I will pass around what you find. The lack of focus is not purely "domestic". This project does not (yet) appear to be targeting any country in the developed world. I would venture two further (possible) reasons for this. One reason was touched upon in Atanu Dey's blog, and the other is down to me being the utter cynic that I am. 3. Manufacturers are looking to increase profitability. Hardware manufacturers will benefit from the economies of scale inherent in such a grand scheme. At the very minimum, they will be receiving orders for 5 million units from the get go. This will no doubt reduce the cost of manufacturing components, meaning their profit margins will increase. This will allow them to make more money on components destined for other, non-charitable products - perhaps ultra portable, ultra readable, long battery-life computers for the tech-savy western hipster. OLPC is a giant technology test. Huge. If OLPC succeeds or fails, the technologies and products themselves will have been proven despite of the outcome. After that, they can all be included in the $2000 laptop for the jet setting executive who's less likely to tolerate technology in alpha/beta/gamma whatever.